Boy, do I have a treat for you today! I am so excited to share this week’s CCC Monday! I have to say, I was drawn into this recipe for two reasons: it uses oil instead of butter and applesauce instead of eggs. I was eager to see the results. Frankly, I didn’t know what to expect. Will they be chewy or crispy? Will they turn out flat or thick? Cakey? They totally exceeded my expectations! They were gorgeous to start with. I simply gasped when they came out of the oven! Then my Taste Tester came ( aka The Hubs ) and grabbed one, still warm cookie. I awaited the verdict…. Shut-the-front-door these are goooood!! So chewy with a slightly crispy edge. But just slightly. Give them some time in the cookie jar and the chewiness totally takes over. YUM! The flavor is caramel-like, perfectly balanced with the chocolate. And… yep, you got it! I sprinkled the sea salt on top! 🙂 Perfection! In a medium bowl, whisk together the dry ingredients ( flour, baking soda and salt ). In a large mixing bowl, mix together dark brown sugar, oil, milk, granulated sugar, applesauce and vanilla. Stir until all well combined. Add the flour mixture and gently fold in. You do not want to over mix the dough. When about half of your flour mixture is incorporated, add the chocolate chips and fold everything in. This cuts down on mixing the dough after adding flour and prevents overmixing. Cover the dough and refrigerate for about 1 hour. Preheat your oven to 375 degrees. Cover a cookie sheet with foil, parchment paper or silpat. Scoop the cookie dough by tablespoons onto your prepared sheet. Bake for 10 – 12 minutes, or until the edges start to brown. Cool on the sheet for 2 minutes and transfer onto a wire rack to cool completely. 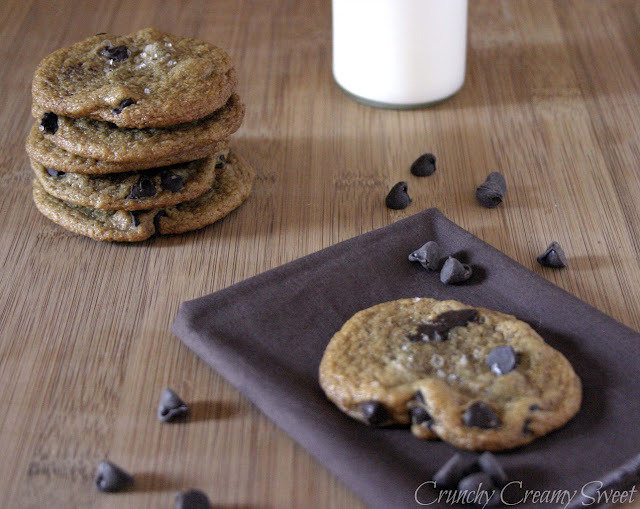 If you are a chocolate chip cookie fanatic, like we are ( thanks to this series 🙂 ), you simply have to try this recipe. Even if you are not vegan. And if you do, please, come back and tell me how you like it. I can’t wait to hear what you guys have to say about these babies. 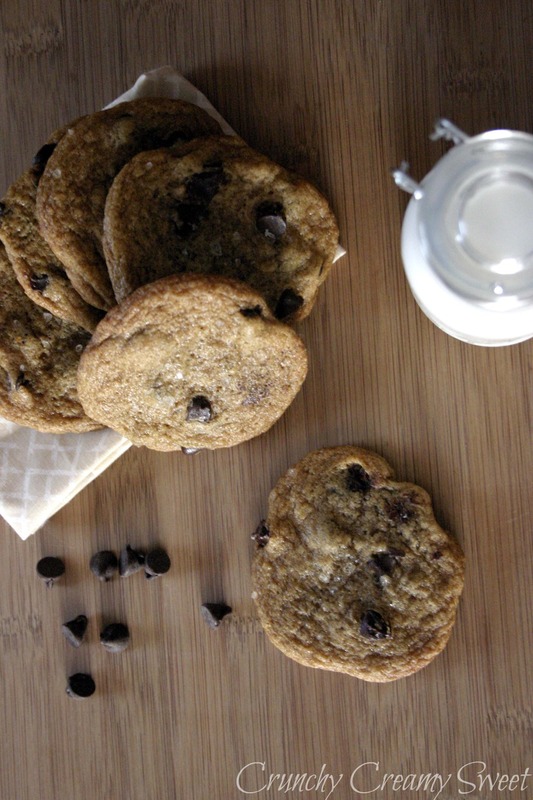 Save the recipe for those days when you find yourself craving a cookie but don’t have butter and eggs. Anyways, make them! Share them! Be happy! Are you vegan? 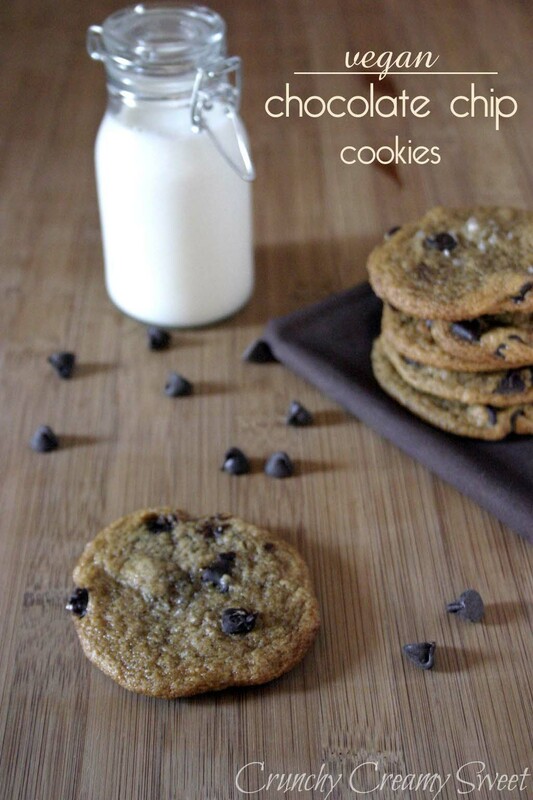 Do you bake vegan style? I have never baked a vegan chocolate cookie recipe. Those sound divine. Looks delicious! I love a good chocolate chip cookie and your recipe looks awesome. 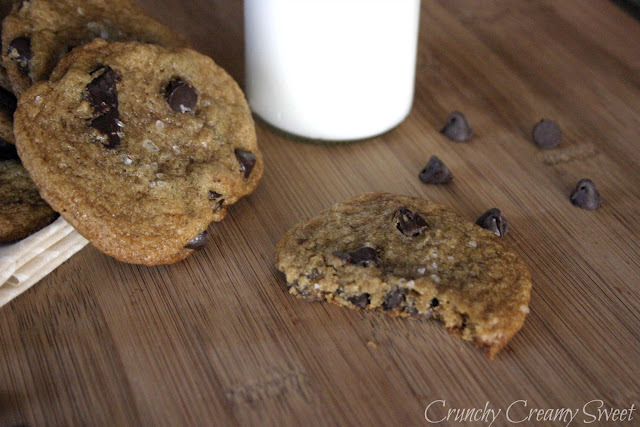 I love this healthy chocolate chip cookie recipe! 😀 and the photo editing and presentation is awesome here 🙂 You did great Anna! I have never baked a vegan recipe. After seeing this recipe I may have to. The cookies look wonderful. These are absolutely gorgeous! They look better than my regular cookies. I must try this recipe! Wow, your description has me sold…caramelly? I'm in!!! I think vegan recipes can be sometimes be a hit or a miss… This one seems GREAT and would love to try this too! First of all, I think I need to source for vegan chocolate chip… they seems quite difficult to find. Sunspire and Enjoy Life are just two of many brands that make vegan ( dairy – free ) chocolate chips. I am not sure what you have in Australia, here you can order them through Amazon. Hope that helps! Thank you, Zoe! Wow, delicious! I have tried baking vegan with the flax egg replacer and it turned out absolutely horrible, so I've strayed away form vegan baking since then. Since this doesn't use the flax eggs, I would be willing to give them a try…especially if the hubs gave them two thumbs up! Oh I love love love that these are vegan. I am vegetarian with vegan tendencies. For baking I prefer vegan with other food I still like a little bit of cheese. 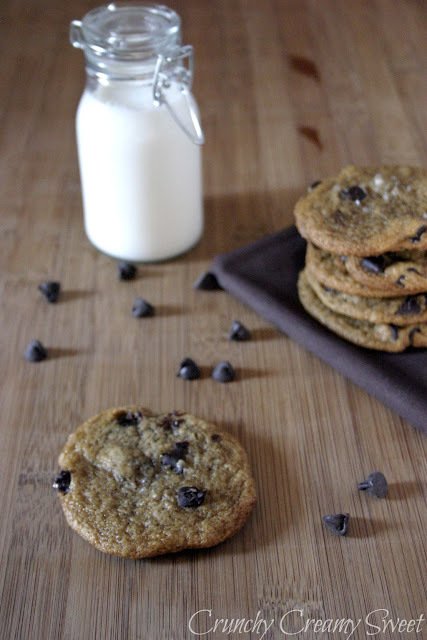 Even if I didn't like vegan baking these cookies look good no matter what, and I love that you added sea salt on top (just a great combo sweet and salty). Sea salt makes any cookie soooo much better! Not that these needed that. I added it just for fun. 🙂 Thank you, Rachel! I am not vegan but I go vegan for a week, sometimes a whole month, depending on season. It is much easier to be vagan in the summer, with so many fresh fruits and vegetables around, I can even go raw! :)Great cookies! I agree! Thank you, Marina! Yum! Those sound awesome! I'll have to try this vegan version! If you do, please let me know how you like it! Thank you!